Peru at a Turning Point: Populism or Pragmatism? In early April, Ollanta Humala, a former lieutenant colonial known for his extreme nationalism, won about 31% of the votes in the first round of Peru’s presidential elections. The results provoked widespread fear in the local and international business communities. During the election campaign, Humala, who loves history books and sports and is an expert at chess, spared no opportunity to criticize the country’s traditional political class, including the political parties of the other candidates that will compete with him in the second round of voting in early May. 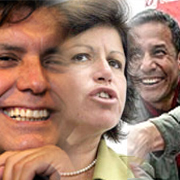 Those candidates are ex-president Alan Garcia, standard bearer of the APRA social democrats and Lourdes Flores, who represents the center-right National Unity alliance. Flores wants to emulate Chile’s Michelle Bachelet and become the first female president of Peru. Garcia is burdened with the stigma of his disastrous turn at the helm of the government between 1985 and 1990. Nevertheless, on the day after the first round of voting, Humala tried to calm the business community by declaring, “A dirty war has been launched against me, and my rivals want me to look like a persecutor of investors.” In his government, he added, “private property will be respected. Don’t view me as a threat.” However, the Chamber of Commerce in Lima told the international press that some 2,500 companies have frozen their Peruvian investment plans because of fears that a possible Humala government will impose risks on their legal security in the country. Whoever becomes the next president of Peru will be taking over a robust economy. Although his very controversial approach increased the average Peruvian’s distrust of their institutions, outgoing president Alejandro Toledo has achieved good macroeconomic results. According to a recent report by the Economic Commission for Latin America and the Caribbean (ECLAC), the Peruvian economy grew by 6% in 2005, its highest rate since 1997. According to the report, these results were achieved “because of extremely favorable external conditions and macroeconomic policies that strengthened the expectations of private companies in the domestic market.” In its analysis, ECLAC stressed “the remarkable growth” of Peruvian exports. This fact has led to an increase in the country’s trade surplus, and an unprecedented surplus in the current account of its balance of payments, to above 1% of the country’s GDP. Thanks to slower growth in its exports and in public spending, ECLAC now forecasts a slight slowdown of growth for 2006, to an annual rate of 5%. Populist Rhetoric: A Mere Campaign Strategy? Ever since Humala arrived on the political scene in October 2005, the Peruvian press has noted that he has had contacts with Venezuelan president Hugo Chávez. There has even been talk that Chávez may have financed part of Humala’s campaign. Nevertheless, Humala and Chávez have denied that there has been any sort of economic assistance. The two leaders maintain that they are united only in their eagerness to support Latin American integration with a nationalistic spirit. Mauro Guillén, a professor of international management at Wharton, says that a possible Humala government would not be as extreme as the government in Venezuela. “However, this clearly confirms the turn toward nationalism and populism in the region: Argentina, Ecuador, Venezuela, Bolivia and now potentially Peru.” Nevertheless, Guillén does not believe that any possible alliance between a Peru governed by Humala and a Venezuela governed by Chávez could stop investments from coming into the region. A special sort of shrinkage in the flow of capital would affect only Peru, he says. “Brazil, Mexico and Chile continue to be economies that are open to the world. And those three countries jointly add up to 65% of the region’s economy,” Guillén says. Ex-president Alan Garcia ended his administration in 1990 by being exiled to Colombia because of accusations of corruption and because of his disastrous management record, which left a legacy of record–high inflation — almost 3,000%. However, during the election campaign, Garcia said he was the only candidate capable of stopping the “authoritarian danger,” which he attributed to Humala. Garcia has committed himself to correcting “the mistakes” of his earlier administration. He has also emphasized that he will battle against poverty. He has come out in favor of a more equitable distribution of wealth, job generation, and initiatives to boost agricultural exports and provide loans to small businesses. Lourdes Flores, a 46-year old lawyer, is known as the “candidate of the rich.” Her strongest support comes from Lima, the capital city, and from Peruvians who live overseas. However, Flores holds little appeal in more remote regions in the interior of the country. Flores says that she is the candidate of free enterprise, and that she will support a government that regulates but does not intervene. She has promised to generate new 650,000 jobs a year, while improving both education and healthcare. Macías Cardona says that the latest election results seem to favor Garcia. If so, that would lead to a second round of voting between Garcia and Humala. However, he says that Flores’ followers have “an important role” in defining the next president. People on Wall Street have a positive view of Flores. They see her as an ally of financial interests; a candidate who is less worried about low-income people. “Apparently, she lost a lot of votes because of her close ties to the powerful Romero group and because of her advertising campaign, which was very close to the one used by the current president of Colombia (Alvaro Uribe) in the previous elections,” he adds. McDermott concludes that people who back Garcia and Flores will probably negotiate with each other in an effort to prevent Humala from winding up as the winner. “The right-center and the left-center could turn out to be modern and responsible; they could reach agreements to present themselves as a ‘national front.’ That’s because their adversary is not only Humala but also the support that Fujimori still stirs up – along with other pressure groups such as the military.” McDermott argues this is a great opportunity that could permit Peru to achieve governability, especially if this coalition is also formed in Congress, where nine different political groups are represented, to one degree or another. “This agreement could do a lot to help the country’s institutional development; if not, we are going to see a lot of volatility,” he warns.